By Jerry Beck | 07/24/2006 3:15 pm | Be the First to Comment! Here’s the first of several posts on a few of the experiences I had, and some of the stuff I got, at the San Diego Comic Con 2006. 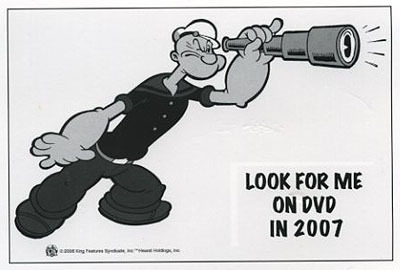 Above is a postcard found on the freebie table touting the release of POPEYE on DVD next year. 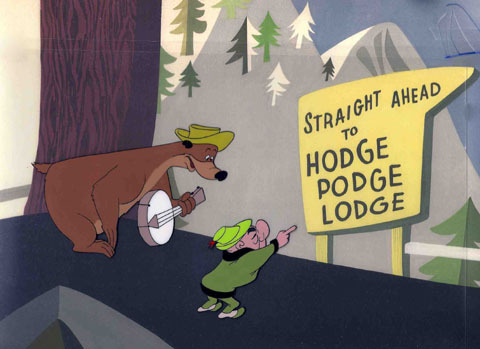 Interestingly, the postcard was provided by King Features, not Warner Home Video. Glad to see such a teaser at this year’s event, but I’m hoping WHV pulls out the stops to promote Fleischer Popeye at next year’s Comic Con.I still collect promotional buttons, and the two best items I got this year were handed to me for free. At the HOT WHEELS booth on Sunday, Mattel Toys handed out these nifty “Matty Mattel” buttons (below left). Does anyone under the age of 45 even know who Matty Mattel is? 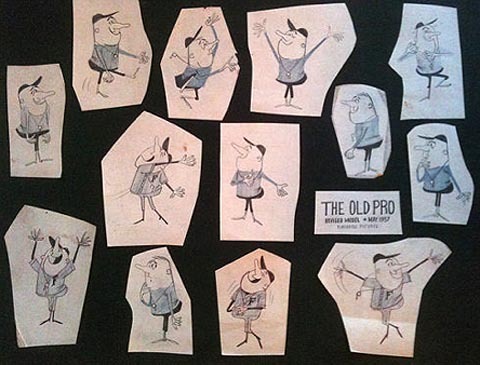 Meanwhile, a few days earlier, fellow Random Cartoons creator Andrew Dickman (Ivan The Unbearable) was spotted wearing this promotional Disney Oswald button (below right). When I asked Andrew who was handing those buttons out, he generously gave his button to me (without me having to beg!). They weren’t given out at the con, but only at the Disney Studio, to Disney employees, the day Oswald was traded back several months ago. Needless to say, I was a very happy camper and wore it proudly all weekend.